Trolls. We get trolls. And we tell them exactly who the hell we are. They???? Pray as God Does Answer Our Prayers…He Always Has A Plan For US…. That’s a complicated question so I’m going to break it down and answer each part one by one. Who the hell I am is a parent who chose to end a wanted pregnancy due to multiple fetal anomalies which were incompatible with life. Every admin on this site has made a similar decision to terminate a pregnancy for medical reasons. We tell people it’s OK because it is, in fact, OK to end a pregnancy. It’s an ethically and morally responsible choice as well as a legal one. 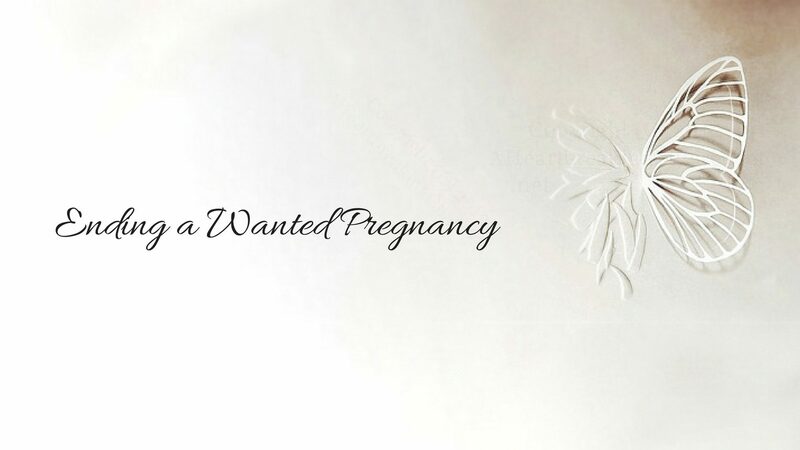 Although we never tell parents which choice they should make, once they decide to end a wanted pregnancy we’re here to support them wholeheartedly. Exodus 21:22-25 — The fetus is not valued equally as human life. Ecclesiastes 6:3-5 — It’s better to die in the womb than live a life full of suffering. Genesis 2:7 — The soul enters man only after he breaths through his nostrils. Answering the question I think you intended to ask … There is no way to know for sure. However, what we do know for sure is that NICUs, special needs therapists, long-term medical care facilities and cemeteries all see their share of those unfortunate wee ones who were not miracle babies. Miracles are by definition rare. If happy outcomes following poor prenatal diagnosis were at all common, they wouldn’t even be called “miracle babies” would they? Parents who terminate a pregnancy for medical reasons are unwilling to risk their child undergoing a great deal of suffering and/or death on the tiny chance that there might be a miracle. I think sometimes the miracle is the compassion and courage that allows you to make a very tough decision. For me, the miracle was finding this supportive community after I’d made my decision. And maybe, just maybe, the miracle is an abortion that allows us to circumvent our child’s needless suffering. This is quite the paradox, isn’t it? Doctors don’t know everything … yet the exact same people who declare that we can’t possibly trust doctors also expect those very same doctors to work the medical magic that will defy the odds and result in a miracle baby. I get whiplash just thinking about it. So which is it? We can’t trust doctors to know what’s right until it comes time for them to work miracles on our babies? 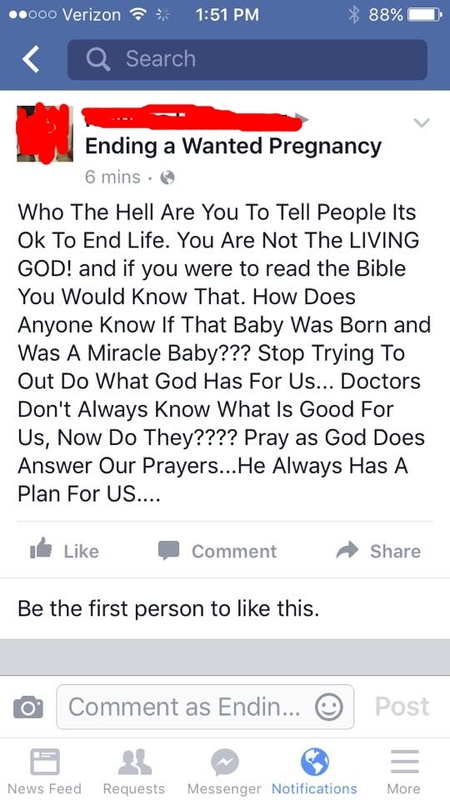 Or we can trust doctors … unless they’re telling us they can’t work miracles, in which case we should ignore the prognosis they give our babies, give birth to a severely medically compromised infant, take her home (because doctors don’t know what’s good for us!) and then do what? Pray? Who I trust is parents. I trust their gut instincts. I trust them to know what is best for their baby, their family and themselves after a poor prenatal diagnosis. I trust them to have a good idea of what they can or cannot handle and what they do and don’t want for their children. Who I don’t trust are loudmouths on the Internet who think their opinions should hold weight in the most intimate and difficult decisions of complete strangers. I don’t trust unkind “believers” who think the word of God is spread by scolding grieving parents they’ve never even met. You know… I realize this is wading into religious philosophy a little deeper than we usually go given the wide-ranging spiritual backgrounds of our grieving members … but I’m going to pull on my rubber boots and go for it. I’m not sure any god whose “plan” is to give an infant only half of a functioning heart or giant holes in her brain or organs floating in a sac outside of his body or a skeleton that doesn’t grow or too many chromosomes as part of a “plan” to teach us “lessons” or as an involuntary cosmic self-improvement program would be worthy of worship in the first place. You denigrate the very idea of God by stating that He would force tiny babies into lives of suffering and early death as part of “His plan” for that child’s parents. I can’t say I know how it all works, but I’m pretty sure your notion of “God’s plan” flies in the face of a loving, all-powerful being. What would you think about a father who set out to teach his small children compassion by torturing their pet kitten? You’re saying essentially the same thing about God when you claim he has a “plan” for us that involves the suffering of our unborn children. That’s a shocking accusation you make about your god, and I hope you’ll think that foolish platitude through all the way to the back before you go mouthing it again.